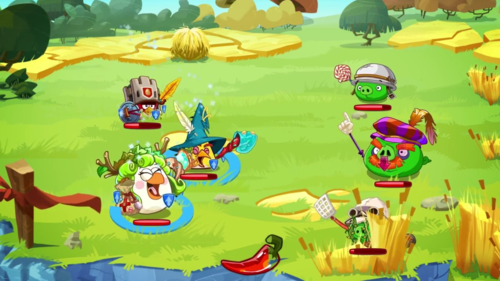 Oh boys, what to say about a new big free-to-play game on iOS, and an Angry Birds one at that. Since they’re marketing this as an RPG, I was curious to try it out. The combat is surprisingly fun, and it feels well developed – although not super advanced, you do upgrade both the classes and weapons/armor of your characters, which adds strategy to the mix. But it’s an RPG in fighting mechanic only, as there’s not much story going on – about as much as you experience in any Angry Birds game – and although I was able to play a couple of hours without having any trouble (and it says I’ve cleared close to 20% of the game), I did finally get to a point where I can’t really win my current battle unless I grind a bit to get ingredients for more potions. But I do prefer being able to grind – basically just go back to old battles, to get the items/ingredients that allow you to build weapons and create potions – instead of the energy systems that just stop you from playing.